We offer career counseling appointments and practice interviews to students and graduates from our ﬁve schools. Current students and alumni can meet with a career counselor for 30-minute, one-on-one appointments. Current students can also meet with a career counselor in a 10-minute drop-in session (Quick Questions). Stop by for a ten-minute Quick Question session to meet one-on-one with a career counselor. It’s great way to learn how to get started on a job or internship search, have your resume or cover letter reviewed, or just learn more about how we can support you. 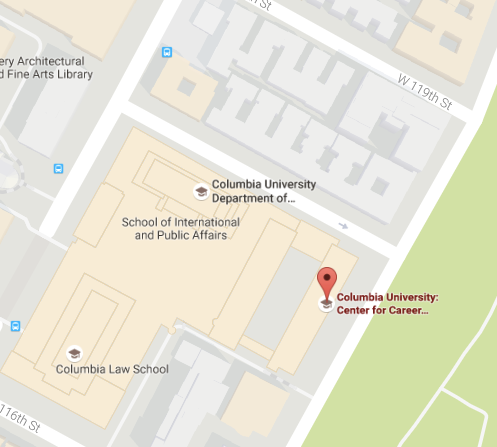 We oﬀer career counseling appointments to students and graduates from five schools at Columbia. Current students and alumni can meet with a career counselor for 30 minutes, one-on-one. Whether it’s an internship opportunity, funding for an internship, or a career-related workshop, we offer lots of career-related programs and services to help you make the most of your job search. Need guidance? Get in Touch! Log into LionSHARE now to schedule a career counseling appointment.